Ring Toss Game - Wooden Ring Toss Set for Camping/Carnival/Outdoor/Lawn/Party/Yard - with Carrying Bag by Tenaly at Scruffs Game. MPN: 43224-1086. Hurry! Limited time offer. Offer valid only while supplies last. Looking for the perfect game for your next tailgate party, camping trip, or backyard BBQ? 【Great Game】 Toss your way to timeless family fun! Looking for the perfect game for your next tailgate party, camping trip, or backyard BBQ? Toss your way to timeless family fun! Whether you're at home in your own living room or at your neighbor's barbeque, it's always the perfect time for a game of ring toss. The Ring Toss Game Set is a traditional lawn game that can provide hours of fun for all ages and abilities. It is a great way to get the entire family interacting and having good old-fashioned fun. In our society of ever-present TVs, Phones and Video Games, this is a great way to get family and friends together (indoors or outdoors) in an engaging game that requires no batteries or screens! The game is made to the highest standards using solid pine wood for the targets and robust rope for the toss rings.It is not only fun to play but also teaches goal setting, improves hand-eye coordination in children and improves one's personal motivation, according to scientific studies. Its compact size and easy portability make it a perfect choice for you to take on vacations, picnics, tailgating, camping, birthday parties, and game nights. -Make it great for developing hand-eye coordination and basic math skills. WARRANTY: Lifetime Replacement Warranty if your not completely happy or the product ever breaks. NOTE: There are many different wooden materials of this toy in the market, please choose the seller named "Tenaly"(the hightest quality) when you place order. 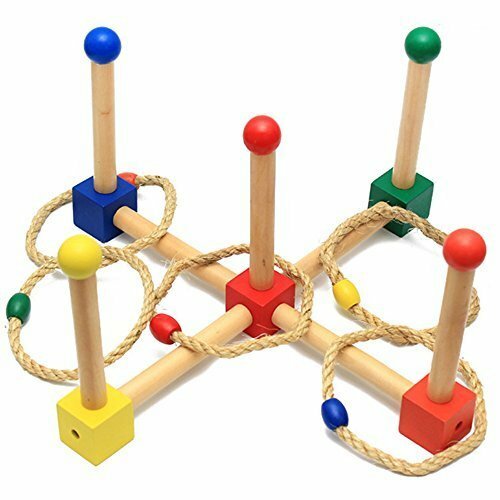 【Full Set with Hight quality smooth wood】Ring toss set included 5 premium rope throwing rings, sturdy wood base with point markings, screw in pegs and convenient carrying storage bag. 【Improve Eye-Hand Coordination】There are varieties of different styles the wooden peg can be piled up. To match different colors of the moduler is not only great for developing hand-eye coordination, but also help kids become more socially adept. 【Suitable dimensions】the rings are 4.7 inches in diameter; Each wooden post is 6.8 inches tall. We did a lot of experiments and finally found it was the most popular size for people to play. 【Easy Storage】You can take it to everywhere because they can be split into small pieces and stored in the a easy-to-carry-bag that comes with this item. 【Pure Entertainment】Entertainment and wholesome fun for all family. Works great on birthday parties , summer picnics and family reunions! Wonderful gift! If you have any questions about this product by Tenaly, contact us by completing and submitting the form below. If you are looking for a specif part number, please include it with your message.